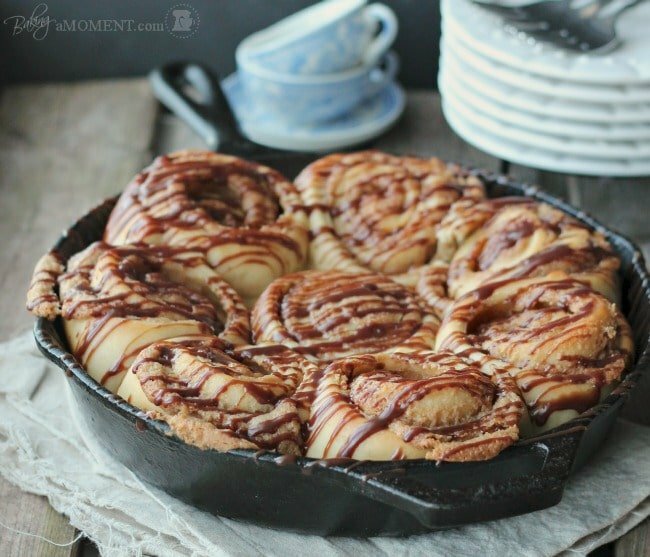 Yeasted Dough Rolled with a Brown Sugar Peanut Butter Filling, and Drizzled with a Milk Chocolate Glaze. 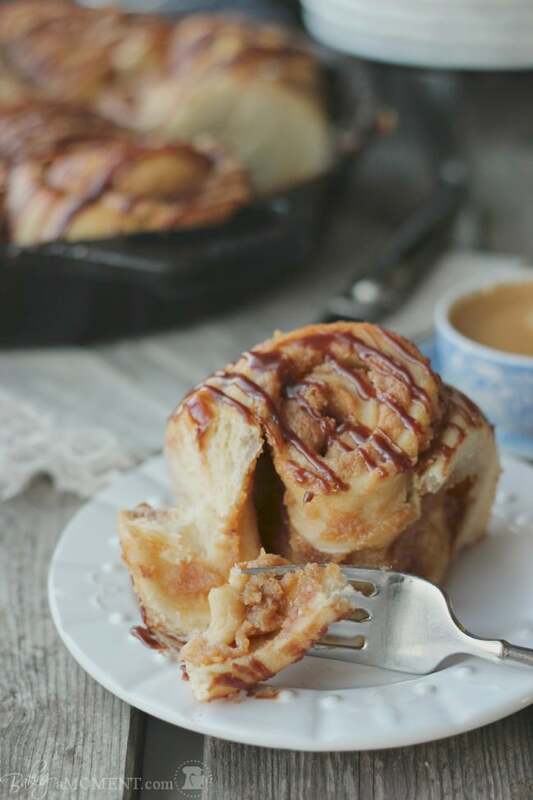 These Sweet Rolls make an extra special Breakfast Treat! I’m married to a control freak. It sounds like a bad thing, but most of the time, I really like it. Kids’ sports schedules? He’s all over it. Works out great, since I’m sorta what you might call “the opposite” of sporty. He also holds the keys to our social calendar, which, for the most part, is a good thing. A) I’m a bit of a homebody, so if it were up to me, we’d probably never go anywhere. And B) He’s an expert on which restaurants to go to. He follows the restaurant reviews like they’re a soap opera. He knows which chef is at what restaurant, where they came from, and who they trained under. If there’s a special occasion coming up, he’ll tell you just where to go to celebrate. Chances are, he’ll even have a little pre-game warmup to recommend; some little hidden-away gem of a cocktail lounge, with the most fabulous aperitif to kick the evening off to a great start. It’s great! Except when his own birthday is that special occasion in question. Mr. Allie turns 40 in just a few short weeks! It’s a biggie! And of course, I had every intention of making it as special as I possibly could. Turns out his dad is also turning 65 (another biggie!) and so Mr. Allie figured the whole family should celebrate both biggies together. He booked the date, the place, and nailed down the menu. Ok, that’s ok, I can plan a party with all his friends then, right? Um, ya, he did that too. ??? What’s left for a wife to do? 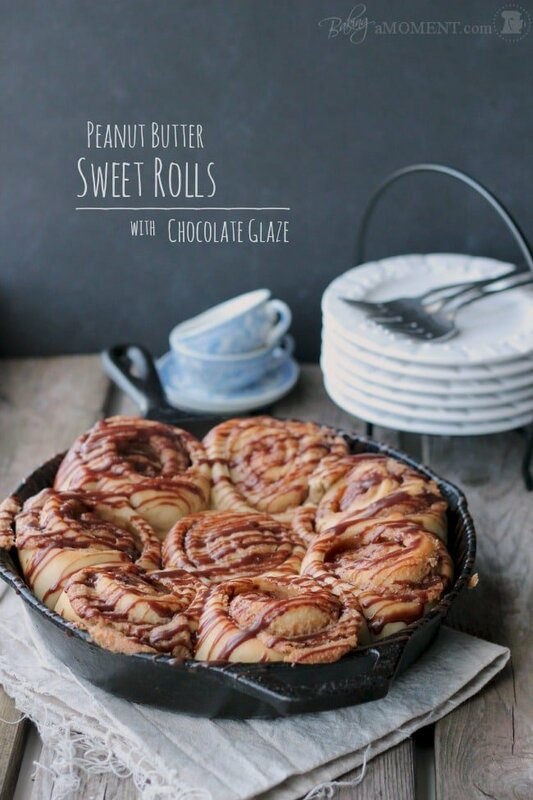 I’m buying some time to get it figured out, with these peanut butter chocolate sweet rolls. Mr. Allie has been begging me for pb desserts for weeks now. And since I can’t seem to get off this breakfast kick, I thought these seemed like a good way to give him what he’s craving. Are you ready for a treat??? 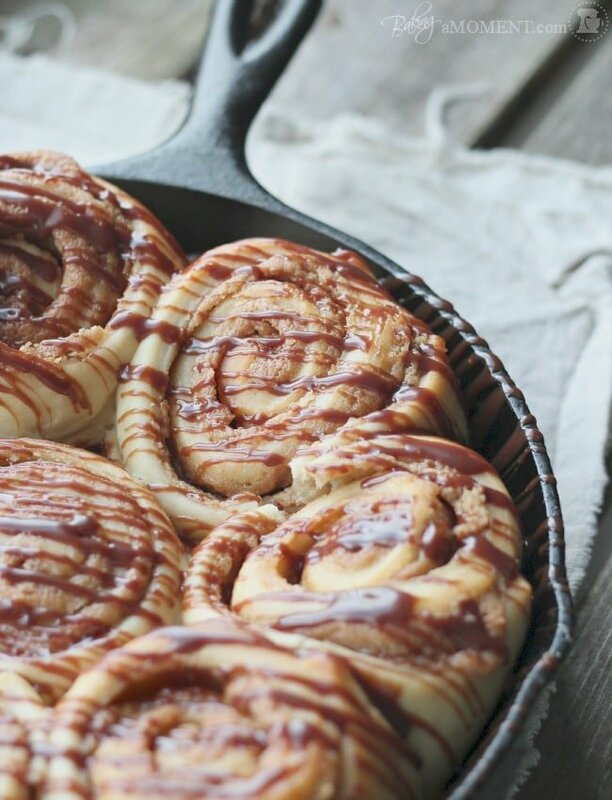 It all starts with Mimi’s favorite cinnamon roll recipe. I gave it an overnight rise to really develop the yeasty flavor. It’s such a pleasure to work with this dough! So silky smooth and dense. I didn’t even need any bench flour, and it cooperated so nicely when I rolled it out. And after it bakes up, it’s soooo gooey and moist, and it has that unmistakable tangy, Cinnabon flavor. I’ll never make another sweet roll dough recipe again, this is it, friends. I recommend rolling it as thin as you can. More surface area on which to spread this glorious peanut butter filling. The filling! Oh, the filling…! It truly is glorious. I could not stop licking this stuff off my fingers. I was like a little kid again, licking the bowl and beaters clean! It’s amaaaaazing! After a second rise and an interminable 25 minutes in the oven, the rolls are golden, puffed, and bursting their seams with peanut buttery goodness. A heavy-handed drizzle of milk chocolate glaze takes them completely over the top. Beat the butter and brown sugar together until pale and fluffy. Add the peanut butter, and mix until incorporated. Set aside. Combine the warm water and sugar in a large mixing bowl. Add the yeast and stir. Allow the mixture 5-10 minutes to proof and get foamy. Combine the oil, buttermilk, egg, and salt in a large liquid measuring cup. Add the mixture into the mixing bowl and stir to combine. Add 2 cups of flour to the mixture, and stir on low speed (with a dough hook attachment) until incorporated. Continue to add flour, ¼ cup at a time, until the dough pulls away from the sides of the bowl and looks clean. Increase the speed to medium and knead for 5 minutes. The dough should stick to itself but not to your fingers. Place the dough in a large, lightly oiled bowl (I used non-stick spray), and cover with plastic wrap. Allow it to rise, in a warm place, for at least 2 hours or up to overnight. When the dough has doubled in size, roll into a (horizontal) rectangular shape about ⅛-inch thick, and top with an even layer of filling, leaving a one inch margin on the edge furthest from you. Carefully roll (away from you) into a long log, sealing with the bare margin. Cut into 8 equal rolls, and place in a cast iron skillet. Cover with plastic wrap and allow to rise for one hour, or until doubled in size. Bake in a preheated, 350 degree oven for 25 minutes, or until puffed and lightly golden on the top. Cool completely, and drizzle with Milk Chocolate Glaze. Chop the chocolate evenly, into small pieces, and place in a small bowl. Heat the cream until simmering. Pour the hot cream over the chopped chocolate, and allow to stand for 5 minutes. Whisk in the corn syrup until well blended. I’ve decided an overnight stay in NYC will make for a nice, “just the two of us” kind of birthday celebration. I’m always hearing about all the great open air markets, boutiques, bars, and restaurants in Brooklyn, so I’m hoping for at least a few hours there, to wander and discover. Any recommendations for me? I know it’s a big and complicated place but I’m thinking Williamsburg… what are your thoughts? Allie, I love these!!! and wow, me and Paul are the exact opposite. I am the social planner of the family, he is the homebody. . but you have to have one of each in every couple. . to balance it out! 🙂 I can’t believe he planned his own party and did everything! That’s amazing and makes it easy for you! 🙂 have a great time in NYC. . and hey, you baked these! Delicious!!! Hey Allie…..I am supposed to be studying, and I am!! I am always on the computer and your recipes come thru….and today you hit it with me!! Peanut Butter….and chocolate….hm mmm!! I’m all about these!! What a lucky hubs you have, getting to eat such delectable treats as these! 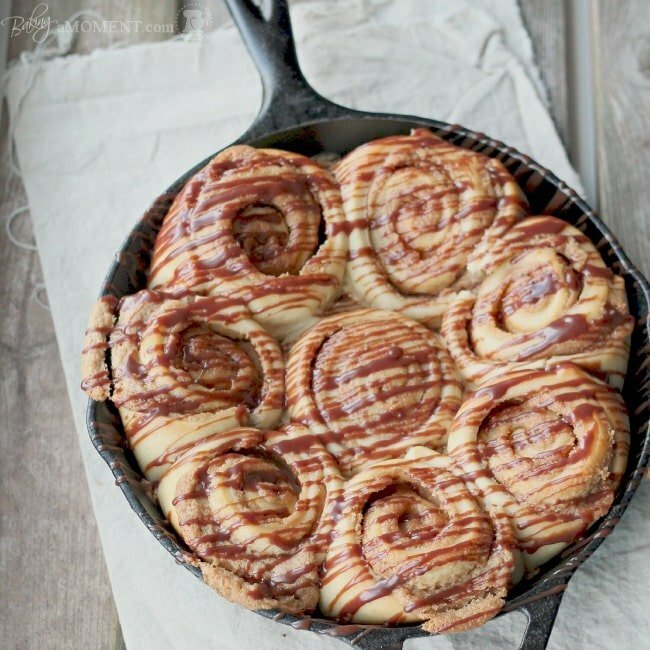 I mean…rolls….brown sugar…peanut butter…chocolate….SO MUCH GOODNESS! So much goodness indeed. Birthdays are for indulging! These were a big hit. Thanks so much for the sweet comment, Kayle! I believe I am going to need my stretchy pants for these. Fantastic recipe! Stretchy pants are definitely in order, lol! Thanks, Eric! That is a great list! I’ve had a few of those items before, but we will definitely have to seek out the rest. And then they will have to roll us all the way back to Philly! Thanks for the sweet comment, Mimi! I think it’s awesome that Mr. Allie is the social planner since it’s one less thing for you to worry about 🙂 Leaves you more time to make these amazing looking treats! 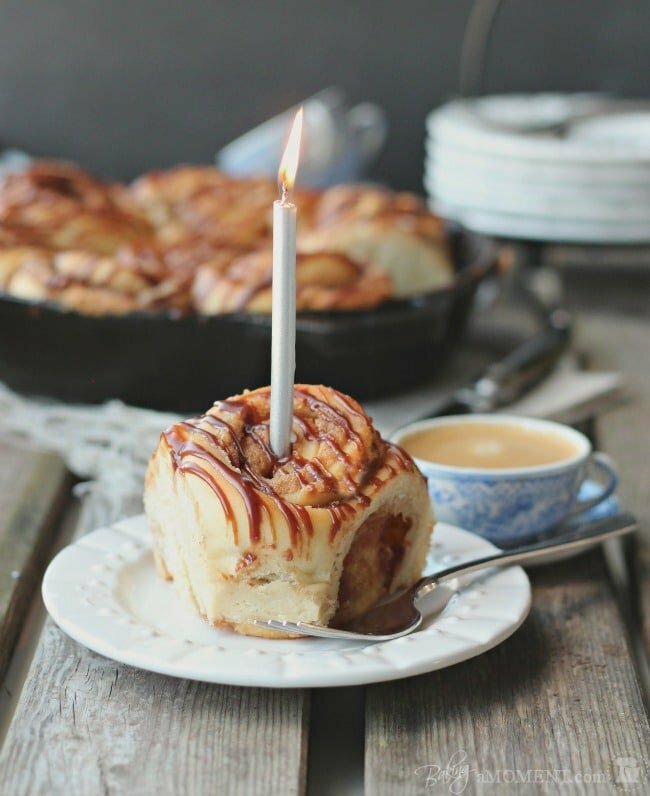 I have an incredible weakness for cinnamon and sweet rolls but have never tried adding peanut butter or chocolate – pinned – holy cow this sounds heavenly! Thanks for pinning, Kelly! 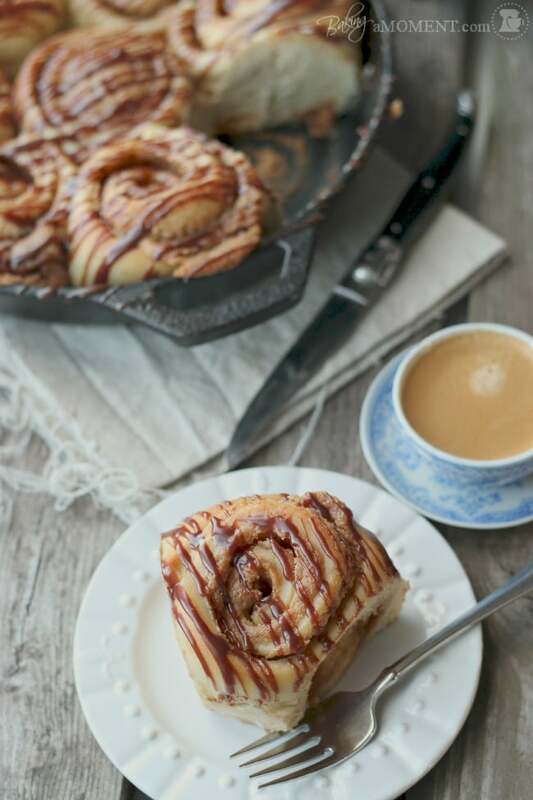 If you love cinnamon rolls you’ve got to try this dough- it’s the best I’ve ever had! I think it would be good with any kind of filling, but this peanut butter stuff is pretty amazing! I hope you guys have a phenomenal time in NYC celebrating, Allie! I love short getaways – they always feel luxuriously long and you get to spend all that time together, doing fun things. Speaking of fun things – these rolls are out of control! I wish I had an entire pan of them in front of me. They wouldn’t last long, that’s for sure. Beautiful photos of a delicious dish! Aw, thanks Nancy! And I hope you had lots of fun on your getaway too! Your husband sounds awesome! What a great guy to take care of everything like that. You’re a lucky lady and he is an even luckier guy for having a wife like you to make him these incredible, mouthwatering sweet rolls!! Hope you have an absolute blast in New York. I’m not great with Brooklyn recommendations, but if you want places to go in Manhattan or Queens, let me know! Thanks, Nora! He is pretty great 😉 I’m sure we’ll be spending most of our time in Manhattan. I’d love your recommendations! Thank you so much, Rachel! I’m so happy you enjoyed. What’s not to like, right? 😉 Thank for pinning too! Whoa! The beauty of chocolate and peanut butter combined is a taste no one should deny. Looks beautiful! Oh Allie, you just made a hungry, sweet toothed woman even more hungry and now definitely craving something sweet, like these rolls. I need one! They sound amazzing! Aaaanad my mouth is watering. Only took me about 4 seconds. These look DIVINE. These rolls are giving me life right now. They are so gorgeous I can’t stop staring! Aw, you are too sweet! Thanks so much for reading and for the sweet comment, Jocelyn! Allie, too funny that we both posted sweet rolls on the same day! Great minds DO think alike! I’m in love with the pb and the chocolate glaze you drizzled on top… oh my. I’m just like you and can be a home body. But when it comes to thinking of the celebration part for big bdays…. it’s me. If I left it up to Justin (like one year for my 35th bday), he brought a Costco sheet cake (I would have preferred the huge tall chocolate cake though!) and brought to the event with over 50 peeps. It was fun and all… but my 40th is coming up and I’m giving him the run down on the plans. JUST so he can feel like *he* is the one planning it… hehe! Anyways…. I’m definitely making these sweet rolls! Have a fun rest of your week, my friend! That is funny, Gloria! When my hubby turned 30 I planned a big surprise party for him, and it was great! So it’s not as if I’m not willing or capable… he just beat me to the punch! So typical, lol! My 4oth is coming up too! We are the same age! Yeah, 40!!! 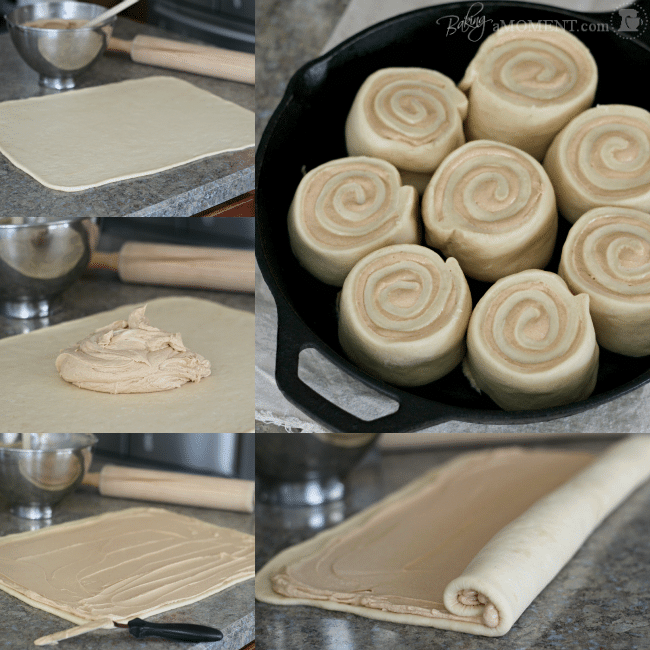 You know Mr J will love these PB rolls for sure!! He is always begging for pb treats. I’m also not the social planner in our house. He organizes everything but usually lets go of his birthday…sometimes since last year he insisted on cooking his birthday dinner. You two will have lots of fun in NYC!! That is too funny Zainab! I can’t believe we are practically married to the same guy! Dave is so picky about dinners too. He’s taken over dinner cooking and planning. I hardly ever get to cook anymore! If I have something I want to make, I need to schedule it with him a few days out. Pfft! oh wow,…MMM, those look delicious, I love sweet rolls! could eat a couple of those right now! 🙂 I Printed your recipe and will give these a try, I seem to always have issues with making the dough. If you like Crème Brûlée, check out my recent post. Thanks, Michael! And I do love crème brulee- so I definitely will check out your post! Hi. I’m new to your blog. These look amazing. Thank you so much for sharing! I hope to make these this weekend but I don’t have cast iron skillets. Do you think I could bake them in a Pyrex glass tray? If so, how should I adjust the temperature or baking time? Hi Rose! Thank you so much for stopping by and saying hello! You ask an excellent question- if you don’t have a cast iron skillet you can absolutely use a pyrex dish. If you have a round pie plate or a square dish that would be perfect. I think the bake time should be about the same. Just keep an eye on them and you’ll know they’re done when they are puffy and a little browned on the top. Good luck and I hope you enjoy! Oh, wow, thank you so much for the link! I cannot wait to go through it and start planning. I really appreciate it, Chris! And thank you for the sweet compliments about my recipe 😉 I hope you’re keeping warm! When I saw this post I seriously died and went to Heaven!!! This has everything I want! I don’t need anything else. Seriously! I am definitely going to try these. Thanks for sharing! Oh yay! I’m so glad you liked the post, Sara! You should definitely try making these, they were phenomenal! Definitely one of the best things I’ve ever made. Thanks so much for reading and for the great comment! Enjoy your weekend! This is a great baked birthday gift! It looks so delicious! I’m sure I could eat several of these rolls! Thank you Coleen and sorry for the late response! You are absolutely right, cast iron is a lot different than say, aluminum. I’d recommend baking them in a heavy glass dish, like a Pyrex pie plate or like an 8×8″, and keep an eye on them. When they start to get brown around the edges, take them out and let them cool a bit. Hope that answers your excellent question, and thanks so much for asking! And for the sweet birthday wishes! This might be the best comment ever. And don’t think I didn’t notice your name, and email address. ! Question- is there a way to make these in advance? Can I bake the rolls and freeze them? And than heat them before serving? If yes- would you suggest doing the chocolate glaze after? Hi Sarah! Thank you so much for the sweet compliments! You can definitely make these ahead and freeze them- and yes I probably would save the chocolate glaze until just before serving. Good instincts! These rolls were very good, but a bit bland, despite the filling and glaze. I think the dough could use more salt, and may have a richer taste if there was butter in the dough, rather than oil. The dough was easy to work with and rolled nicely. I did the bulk fermentation in the fridge overnight, then rolled out the dough in the morning, added the filling,, proofed for 1 1/4 hours and baked. The recipe yield of 8 servings is misleading. A yeast dough with 4 1/2 – 5 cups of flour yields more than 8 rolls. I ended up with 12 rolls and they were huge. I didn’t make any adjustments to the recipe. The filling was creamy and fluffy when spread on the dough, but had a slightly grainy texture in the baked rolls.